One year on from the wonderful 2012 Olympics, London is hosting its anniversary games. In a bid to build a lasting legacy, events are being re-run and, as hoped for by organisers and sponsors, capturing the public’s imagination. Last year, I posted some snaps of the men’s road race. I was reasonably happy with the outcome but one thought lingered: clear, fully-focused images of cyclists speeding by might capture what happened, but they don’t capture the moment. The camera captures events with a level of detail that people do not. For us, everything whizzes by in a blur. So this year, I was determined to try and capture the moment and not the facts. 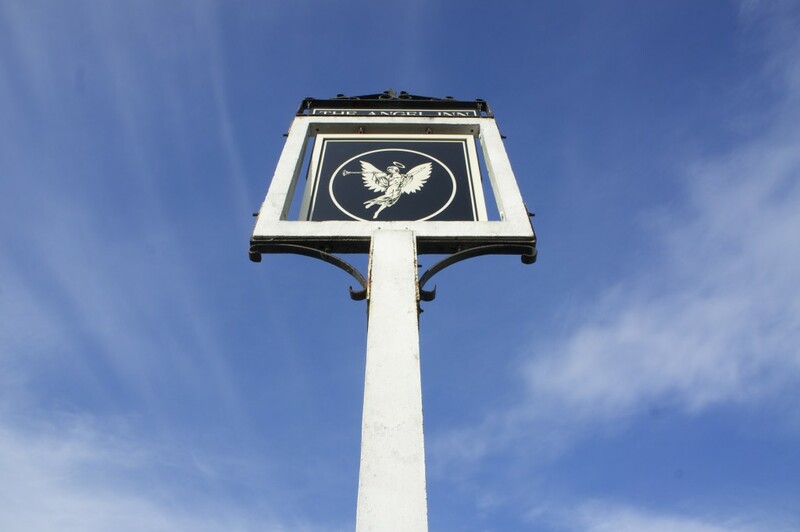 I staked out a place on a simple, straight stretch of road conveniently located right by The Angel. 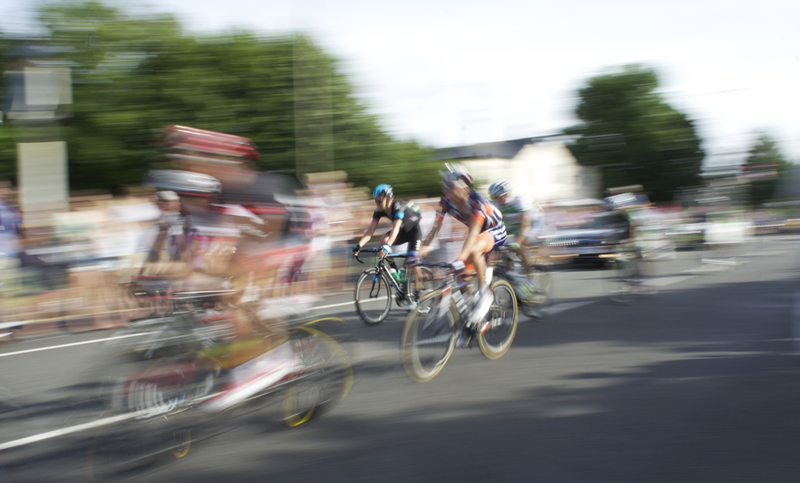 Having found a comfortable spot, I decided the best way to capture the sheer speed of the cyclists was to use blur. The technique is simple in theory and hard in practice. Essentially, all you need to do is move your camera at the same speed as your subject. 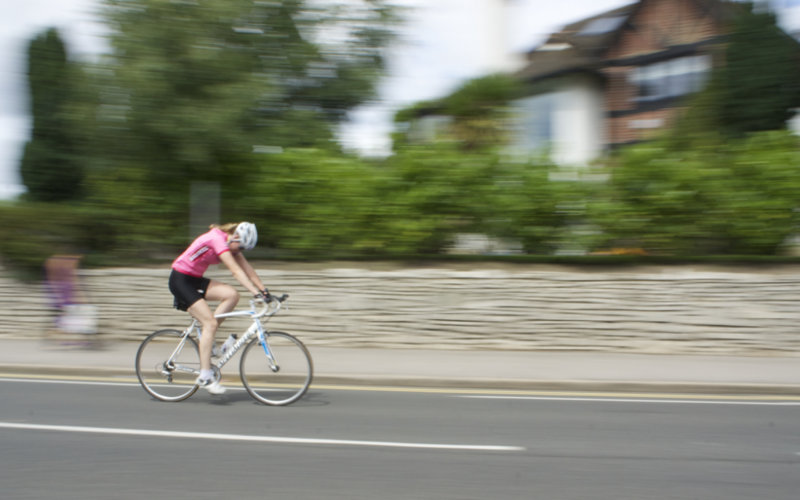 Obviously, panning a camera lens at the same speed as a cyclist is tricky and you only get one shot. Fortunately, the amateurs went first – they’re not that fast and there are loads of them so plenty of opportunities to get my eye in before the pros arrived. This image of a competitor, who’s not going super-fast, was an early attempt to get the effect I was after. Trying to use the same effect with multiple cyclists was a bit more tricky – they’re travelling at different speeds so only one can really be in focus. Also, the panning appears to warp straight lines a touch (see the road markings). A while later, having crossed the road (and after a drink or two), the pros came. Preceded by police outriders and heralded by a helicopter, they flew past in the blink of an eye. This is one of the early riders who was ahead of the pack but not leading. It is my most technically accomplished image of the day (make of that what you will). Then it got a lot more tricky. When the main group hove into view, I’d set myself the task of picking out one rider and getting them in focus. I opted to capture a Team Sky rider. All technique went out of the window. Nothing was straight, everything was blurred, including most of the Team Sky cyclist. This shot has been cropped and had some dust spots cloned out but is otherwise unedited. For me it really does capture the moment, and the amazing speed and the determination of the riders. This article was also published here on Medium.